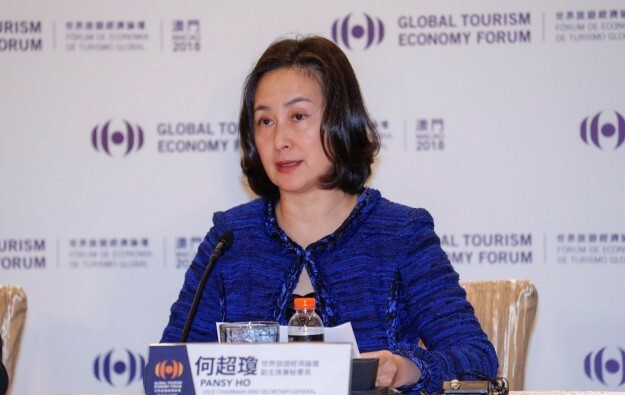 Pansy Ho Chiu King (pictured), co-chairperson and executive director at Macau casino operator MGM China Holdings Ltd, said on Monday she was confident about the outlook for the city’s gaming and hospitality industry despite macroeconomic uncertainty in China and Chinese consumer concerns about the United States-China trade war. “I think we are very confident. In fact, we have been, luckily, already going on the right track,” remarked Ms Ho on Monday. She was referring to efforts of Macau’s casino operators in terms of developing the city’s non-gaming tourism offerings. Ms Ho was speaking on the sidelines of a press conference about the Global Tourism Economy Forum 2018 due to be held in Macau later this month. The annual event is supported by the Macau government and Ms Ho helps to organise the gathering. The MGM China executive director declined to comment on whether the firm was already in talks with the Macau government over possible short-term extension of the firm’s current Macau gaming rights. They are due to expire in 2020, but local gaming law allows for short-term extensions – up to a maximum of five years – before a fresh public tender process is required. Ambrose So Shu Fai, chief executive at rival operator SJM Holdings Ltd, mentioned in June that his firm was interested in a two-year extension for its Macau gaming concession prior to its scheduled expiry in 2020. MGM China’s Macau gaming permit technically stems from a sub-concession spun off from the rights of SJM Holdings. U.S.-based MGM Resorts International is the parent of MGM China.